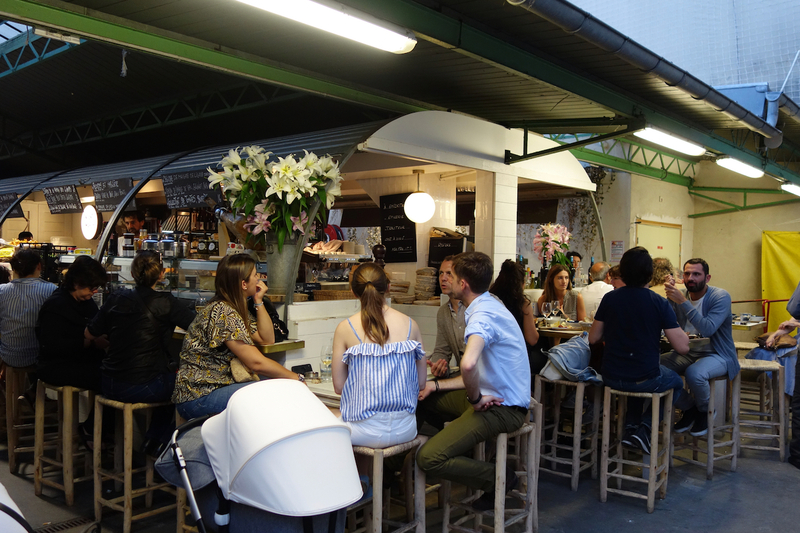 A key charm of the Marché des Enfants Rouges has long been the discrepancy between the surrounding Marais’ chic tourism and the humid food-hall atmosphere of the market itself. 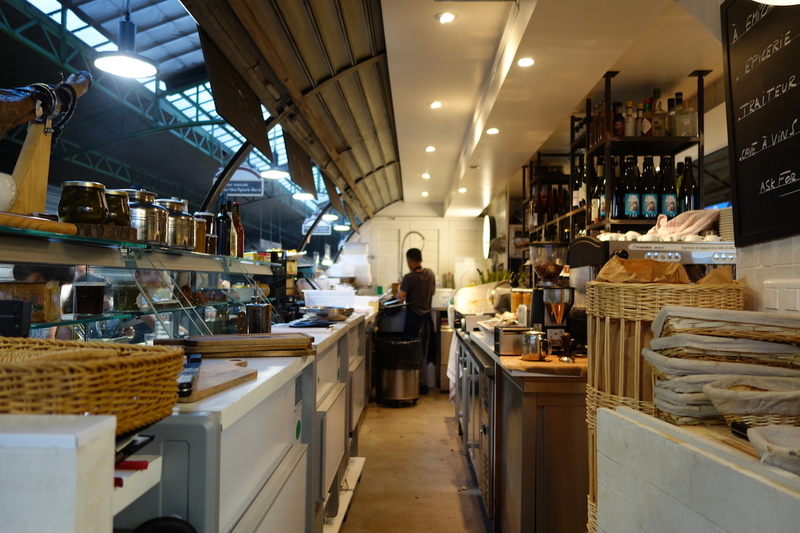 Les Enfants du Marché – a frankly luxuriant, avant-garde dining counter tucked in the rear right of the market – is arguably the first establishment to bridge these two cultures. Opened in late 2017 by former Soma manager Michael Grosman and his associate Laurent Perles, Les Enfants du Marché delivers the masterful cuisine – and the prices – of a cult fine-dining restaurant, in an environment more reminiscent of a taqueria. 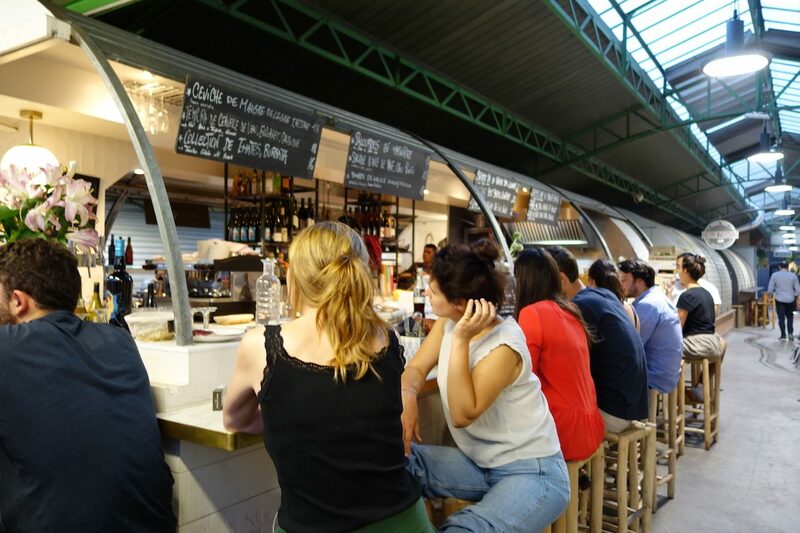 Encircling the market stand is a long, 270° bar, supplemented by two four-top tables and one large communal table. 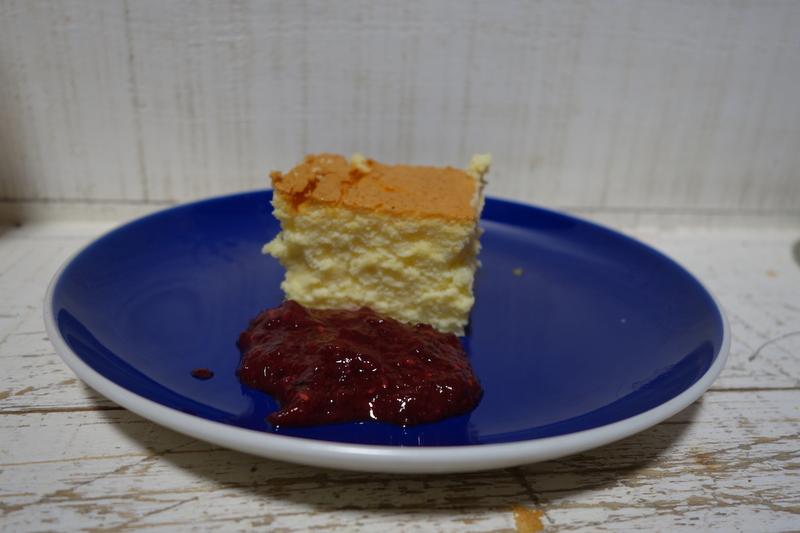 Reservations are not taken. 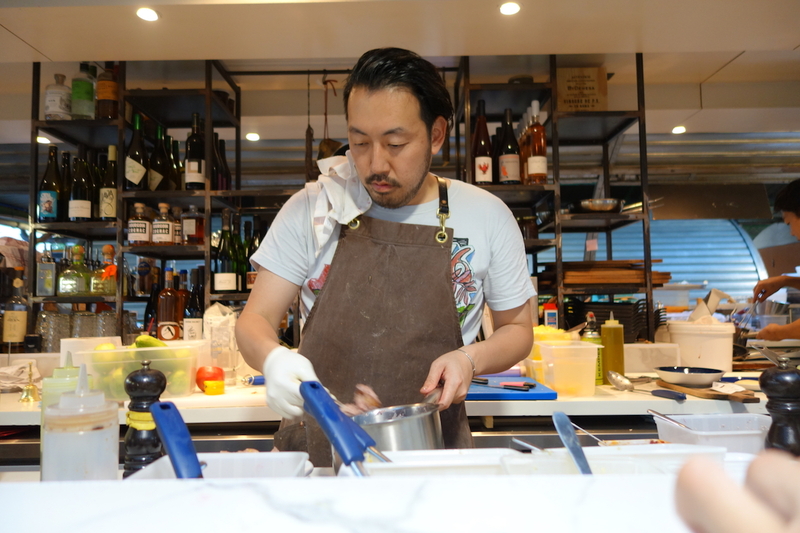 Inside the ramshackle but well-equipped kitchen, the deadpan Japanese chef Masahide Ikuta wields a flair for surprising combinations and unforgettable plating. 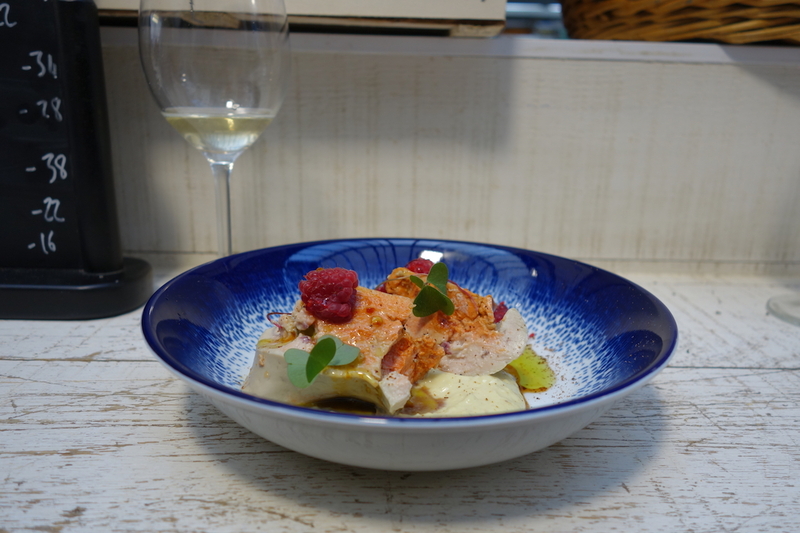 He is not one for tweezer cuisine: everything at Les Enfants du Marché feels outsized and impactful, like a pile of sword-sized razor clams in a sea of butter. At such scale the creatures resemble an H.R. Giger drawing, but fear not: the flesh is as tender and as nuanced as anywhere back on earth. 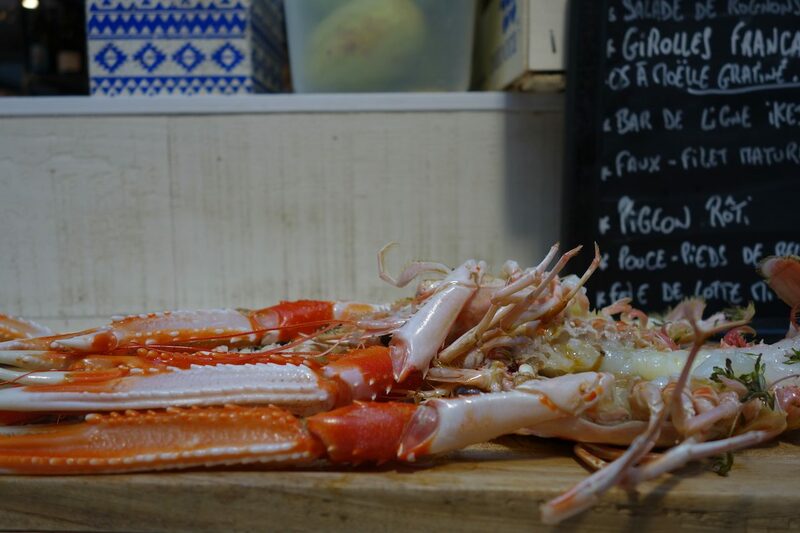 Elsewhere on the menu one encounters halved langoustines the length of lobsters, grilled to perfection, and a silken, fist-sized veal brain in delicate tempura batter, accompanied by a coiled of cross-hatched squid and enough sauce gribiche to sink a ship. The wow effect of most dishes manages to take the sting out of their prices. For smaller appetites or between-mealtimes, Les Enfants du Marché also proposes a selection of cured meats, cheeses, and shellfish. 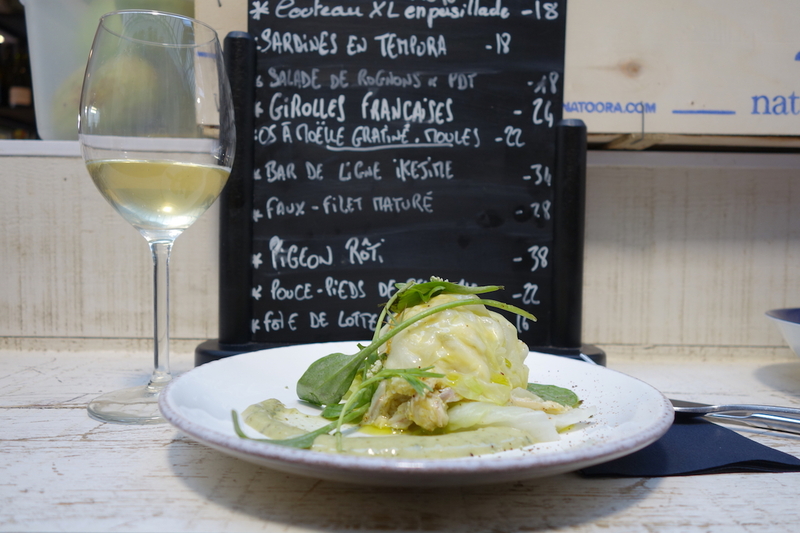 The slim, well-chosen natural wine list is offered at standard restaurant margins, marking a break from the cave-à-manger format popular in east Paris. 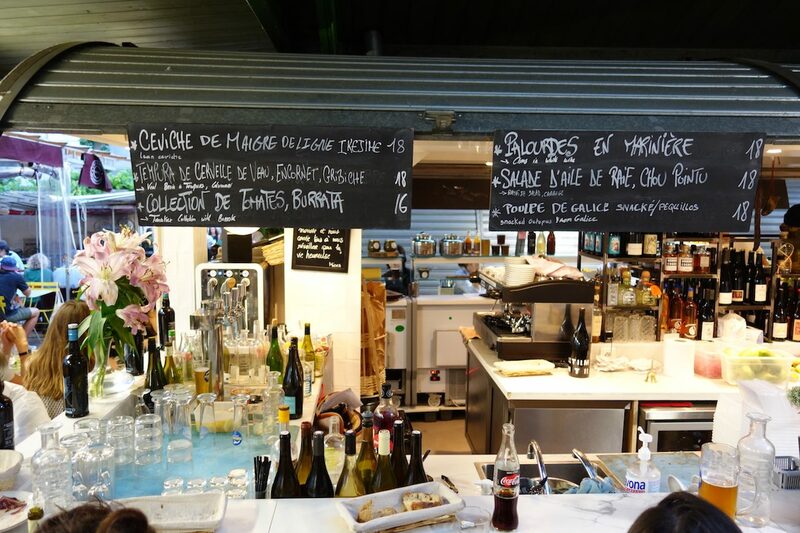 This makes Les Enfants du Marché more a site for serious dining than for serious drinking, though the latter is encouraged, too, in the form of an excellent Normandy microbrew on tap and a small collection of artisanal spirits. Service is kind and attentive, if sometimes a tad overstretched at peak hours. In addition to functioning like a high-end restaurant at mealtimes, Les Enfants du Marché is open throughout the day, the same hours as the market itself, offering services as a wine shop and épicerie, not to mention for indulgent apéritifs on Thursdays, Fridays, and Saturdays, when the restaurant is open until 10:30pm. On other days, Les Enfants du Marché closes at 5PM, making it one of the more notable Paris restaurants to place its bets on the luxury lunch crowd. It’s an audacious strategy, but not overly so, given the talent and originality on display in the concept. For daring, indulgent cuisine in a groundbreaking environment, there is nothing like it in Paris, let alone the terminally hip Marais or the quaint little Marché des Enfants Rouges. Hours: Open Thursday-Saturday from 9am-10:30pm; Open Tuesday-Wednesday & Sunday from 9am-5pm; Closed Monday. Le Monde (2018) François Simon calls this joyful and honest cuisine for the delight of customers settled on high stools surrounded by a market purring like a happy cat. Le Figaro (2018) calls Les Enfants du Marché a guaranteed springtime success, but notes that the prices hit hard.